Over the years I have found that every person I’ve met is guaranteed to ask me two questions in conversation: “what’s your name,” and “why Japan.” The first answer is easy: my name is Jayelon. I’m a junior at the College of Charleston, majoring in International Studies with a Japanese Studies minor. The second answer is a little more complicated and would take longer to explain, so I’ll skip the boring details and give the short answer: a friend let me borrow a manga (Japanese comic book) in sixth grade and I was hooked. I started watching anime (Japanese cartoons), studying the language both in private and with a tutor, and learning the culture. I liked the challenge Japanese presented; not to mention I though it was super cool to learn such a complex and difficult language, one that I felt was off the beaten path. Many years later and I’m less than a week away to visiting Japan for the first time! Now don’t think this trip will be all play and no work; I’ll be spending six months with a Japanese host family, going to school at Kansai Gaidai University in Osaka, Japan, intent on speaking as much Japanese as possible and getting a deeper understanding for the culture. I chose Kansai Gaidai because I have heard nothing but good things about it and the program, both from my teachers and those who have gone, and financial aid applies (a.k.a. automatic green light). In the future, I also plan to teach English in Japan; this trip will give me experience in the country so I won’t be completely unprepared when I return to accomplish that future goal, or it could steer me in a different direction entirely. 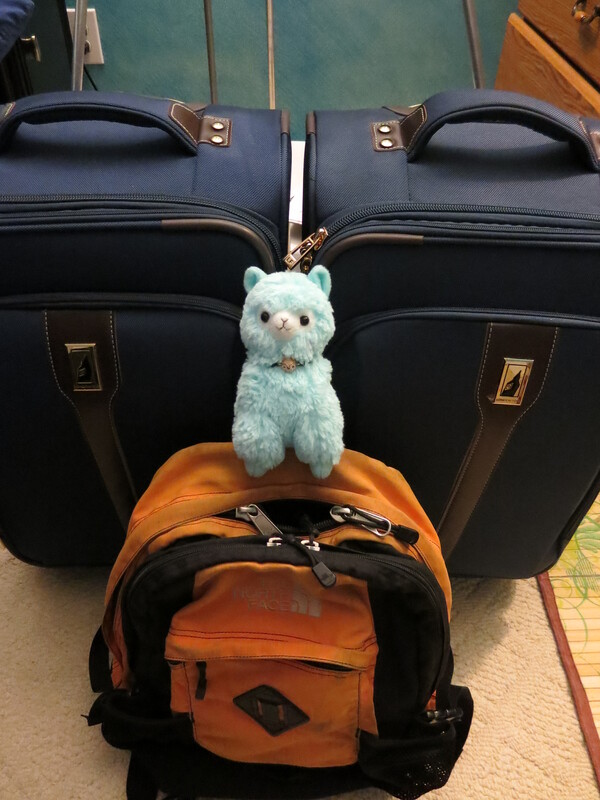 New luggage, handy backpack, and Balphonzo; Japan here I come! Until then, I have nothing to do but study up on my skills, figure out what in the world to bring, and think about how outside my comfort zone this is. I’m not going to lie; I like my sense of normalcy. I like the food I eat, the clothes I wear, and the places I go. I especially like speaking the same language as everyone around me, and it stresses me out to no end not to know anything about what lies ahead.To add to that anxiety, this is my first time out of the country, and I will be the only one going to Kansai Gaidai from my school this semester *cue panic attack. * However, I’ve had lots of family, friends, mentors, and past Kansai Gaidai students give me enormous amounts of motivation, hugs, chocolate, tips, and information in the past six months for the journey ahead, and I know that I can weather whatever the next six months decides to throw my way and come out the other side with some fantastic memories and stories. So as I wait, I will continue to wonder about what lies ahead as I am finally going out my door on my first journey outside the country. Where I could be swept off to, I have no idea; I only know the adventure that could change my life forever happens in less than a week. Good luck, sweetie pie. Have a safe and wonderful experience. Don’t forget to eat at Jiro’s, it’s only $300 but you have to book a reservation 2 months in advance if you want to get a seat. Take LOTS of pictures! Love You!